Spend $25 or more and enjoy FREE DOMESTIC SHIPPING! 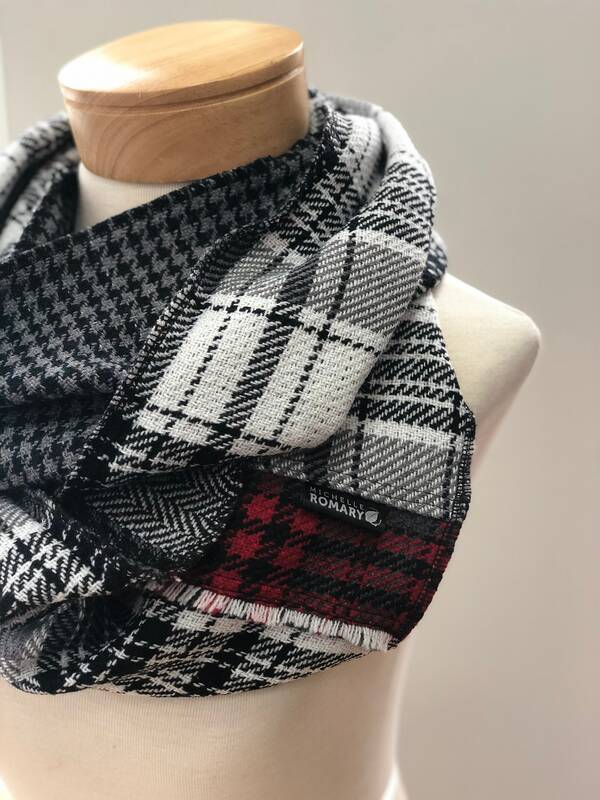 This incredibly soft and luxurious dual sided infinity scarf features a winter white, gray, and black plaid on one side and a gray and black houndstooth pattern on the reverse side, in addition, Michelle has added a complementary band of dual sided red, gray, and black plaid with a reverse side featuring a black and white herringbone pattern. 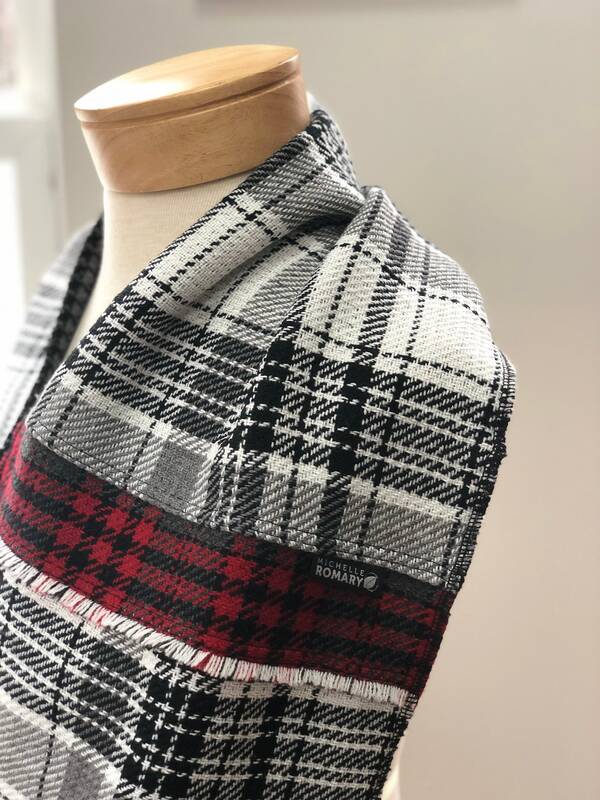 This circle/infinity loop of beautiful fabric looks fabulous as a casual addition to your outfit, or an accessory to your favorite coat or jacket. It is looped twice in the photos shown here on a women's size small dress form. Approximately 66" in circumference. Approximately 12" wide. When machine washing, use cold or warm water setting. 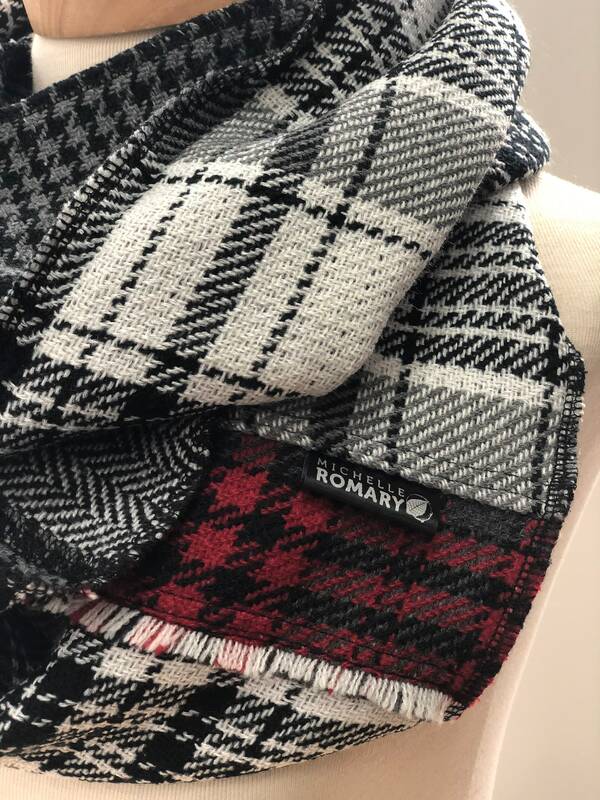 Line Dry or Machine Dry at low temperature with a Michelle Romary Organic Lavender Sachet. Remove from dryer as soon as garments are dry. If ironing is required, use moderately warm iron avoiding the tag. Thank you for checking out my shop! Each item is carefully handmade by me with love in my smoke-free home. 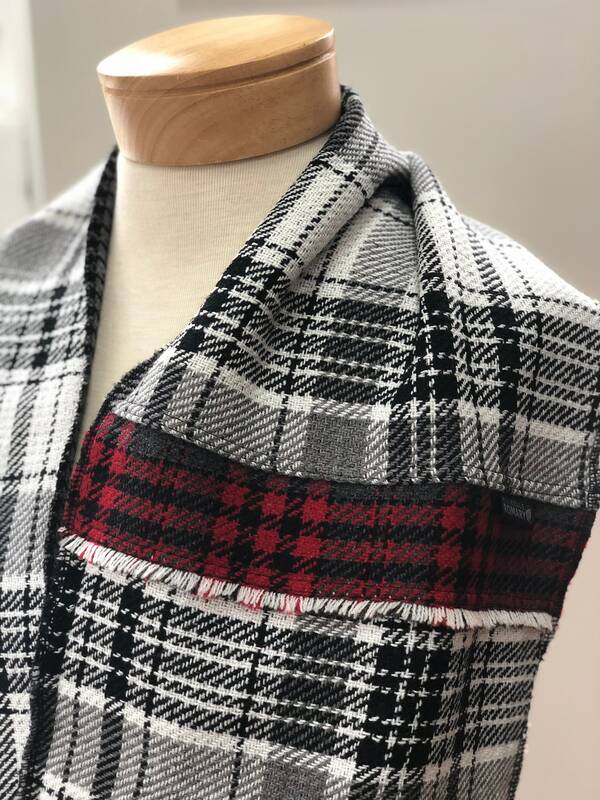 I make items that I adore, using patterns that I create, and I only buy interesting, fashionable, and stylish fabrics! I add new items every week, so please add me as a favorite, and visit often! In addition, I am a Cleveland based singer and songwriter, if you like indie pop-rock music please check out my EPs, you can download them digitally or purchase the album. To learn more about my music visit my website at michelleromary.com. Thank you for supporting indie-homegrown artists like me! Music & Passion were always the Fashion. I accept payments through both PayPal and Direct Checkout. Customers in Ohio will be charged sales tax. I do my best to ship out all of my orders within 3-5 business days (if not sooner). Most orders ship First-Class Mail, which is a 2-5 day service, unless the package requires Priority Shipping, as determined by the USPS. If you need it sooner please contact me and I can help you upgrade to a faster shipping method. All items are carefully packaged and shipped via USPS. I will send all items out within 3-5 business days (usually faster) after payment is received. Domestic: Most orders are shipped USPS First Class Mail, which takes about 2-5 days. International: Orders are shipped USPS First Class International Mail, which takes about 5-14 days, but has been known to take up to 20 days. As the buyer, you are responsible for any customs charges, and USPS does not include tracking. Please let me know if you would like to insure your order or if you prefer to upgrade to FedEx. All items ship to the address entered at the checkout. Sending it as a gift? I can definitely mail it to them instead! Let me know in the notes to buyer section and i will make sure to exclude a packing slip and I will be happy to add a note from you and gift wrap your order at no additional cost! If you have any questions or need any help with your order please don't hesitate to message me. If you are unhappy with your purchase, for any reason, please let me know within two weeks of receiving it. I want you to love your new purchases! Returned/Exchanged items must be in the same condition as when they were sent to you. I do not accept items that have been worn or damaged. Once I receive your return/exchange your card will be credited for the merchandise amount or I will send out the replacement item. I will do what I can to make sure your purchase gets to you in perfect condition. However, if your order is damaged or lost in transit, I will issue refunds or replacements if you notify me within two weeks. I do not cover shipping costs for returning an item. I offer my items for consignment and wholesale. I currently have items in 5 stores in Northeast Ohio. If you are interested in featuring Michelle Romary Apparel and/or Michelle Romary Music in your store please contact me.